Are you ready to go back to school? We have 2 weeks left in our summer and, while we continue to enjoy our summer fun, we are also taking steps to mentally prepare for a new school year ahead of us. Are your children excited about going back to school? Luckily, Smarty is really looking forward to it, more than she was last year. She is eager to know who her teacher will be and hoping that her two best friends will be in the same class as she is. She is also talking a lot about what she hopes she will learn this year – mostly she is both excited and apprehensive about having to learn cursive. We, as parents, are a little nervous – Smarty spent her last year with a teacher who was an efficient factory worker. She only focused on 50% of her class that could improve from her “middle of the road” instruction while ignoring the needs of the strongest and the weakest. Tomorrow I will be sharing what we learned about public schools and gifted students so far in Back to School post, and I hope that you will come back and read that post. In addition to this “optimistic schedule”, Smarty wants tp continue with her gymnastics classes, take another month of tennis lessons and, of course, play with friends and visit a library at least once a week. Perhaps she should just skip school itself? In the past years we always used reading to get excited about the first day of school and prepare for the year ahead. This year we don’t do it, since Smarty is reading books that deal with school anyway (like Harry Potter and Percy Jackson series). 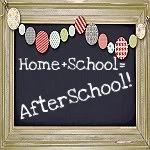 Fantastic Fun and Learning shared a great roundup of books in After School Link Up next week – they should help soothe those first day jitters… at least for kids, not necessary for parents or teachers! We also have two weeks of summer left, but they will be busy since we are cramming two road trips into that time! We actually have three weeks left before school starts. C is spending this week learning to create 3D games using AgentCubes. M is at dance camp in the afternoons. It's been a busy summer, but they're winding down now and getting ready to head back to school. Thanks for hosting. What a great idea to let your daughter take responsibility and plan her day. If my boys had their way, we'd do nothing but board games and run around. If Princess had her way it would only be crafts and dancing..... Maybe some singing. I like Smarty's schedule. I think I'll see if I can get my youngest two to put together their idea of a good school year, too.